LAST UPDATED Saturday 6:50 P.M.
It’s Freezer Cooking Day for me! I love to stock my freezer with prepared foods, and meal helpers. By meal helpers, I mean food that I can pull out that is prepared and ready to make into a meal. For example, dried beans that I have cooked, cooked chicken, cooked ground beef. It makes cooking a lot easier. muffins – Might make Vanilla Muffins. I ended up making Pumpkin Chocolate Chip Muffins using pumpkin from the freezer. We grow our own, and I freeze it. These are delicious! I’m making all of the above out of my pantry, without going shopping to do it. The chicken was already frozen raw, but as we’re getting half a cow in the next week, I need the empty the chest freezer. The cooked chicken will fit in the fridge freezers, I have 2 fridges. I plan on baking until I run out of flour. It took me two days, (I’m moving very slowing these days)but I got everything done! Cooked Chicken -8-3 cup bags of dark meat, (we used 3 cups for supper tonight) and 1 bag of white meat that has enough for about 10 meals for me. Pumpkin Chocolate Chip Muffins – 24 in freezer, 10 for breakfast in the morning, 1 for taste test….yummy! I made all the above from what was already on had on hand. I need to get more snack foods in the freezer, but I can’t make anything else, until we get our 1/2 cow and I see how much freezer space I have left. I also want to try my hand at making homemade granola. 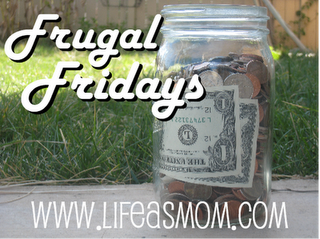 For more Frugal Friday tips, visit Life as Mom. I've heard of vanilla cupcakes, but never vanilla muffins. I bet they're good! the vanilla muffins ARE good. Not nutritious in any way, but so yummy. I'll post the recipe next week. I think I will try the vanilla cupcakes. They look great. Congratulations on the successful cooking day!